Real Estate Decisions are some of the MOST important decisions we make. As home owners, buyers and sellers, we realize the necessity of having a true professional work with us though the entire process. Someone with may years of experience in sales and marketing and someone with unquestionable integrity. As a real estate investor, it is an added bonus to have a realtor that knows the Corporate world and understands the long range impact of property purchases. I have spent my entire adult life in sales and sales management. I have 25+ years in the Corporate World and have been successful in negotiating and closing multi million dollar sales contracts. My business back ground gives me important skills like analyzing, problem solving and achieving goals. I am a Certified Negotiation Expert. Simply put, I have the ability to secure winning contracts for my clients. I am known as a sales leader, expert negotiator and customer advocate, but best known for my ability to work with my clients and obtain the BEST deal possible for them. 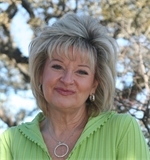 After retiring from the Corporate World of sales that has taken me worldwide, I have chosen to apply that experience and expertise to helping clients buy and sell Real Estate in the Texas Hill Country, concentrating on the Highland Lakes area. My husband and I live full time on beautiful Lake LBJ and love the people, serenity and beauty of the surrounding area. I am now a Realtor with the most successful Real Estate Company in the area--RE/MAX Horseshoe Bay Resort Sales Company and I am excited to hear about your real estate needs and dreams and look forward to helping you make those dreams come true. As your Realtor, I will offer the latest in technology to promote your home and offer you the best in customer service. I provide personal attention to every client, am always honest and will keep your best interest at heart. My goal is to make your next Real Estate transaction the BEST you have ever had! !